On Friday 21st October Chilcote boys' football team played against Colmore School at Yardley Wood playing fields. The game started with Chilcote on top. They were passing the ball really well and creating a few chances. Eventually the ball got to laid through the Colmore defence and Damian scored the one on one. Shortly afterwards, Damian grabbed his second goal of the night with a lovely finish with the outside of his foot. The score at half time was 2v0 to Chilcote. In the second half the game was more even and both teams had chances. Chilcote eventually scored again with a sweet half volley by Abdur-Rahman into the bottom corner. Then Colmore scored a goal courtesy of an own goal after a good shot from a corner hit a Chicote leg. Then, just before the end Damian scored his hat-trick goal with another good finish. A superb result for the team and a great performance. Well done to all of the bots who were involved!!! On October 14th, we held a coffee morning for Macmillan Cancer Support and some of the School Council delivered a presentation. We sold cakes and cupcakes for 50p to raise money for charity. We counted up the money and it came to an amazing total of…£397.47! During assembly, we performed our presentation to the whole school, we were a bit nervous, but it was fine. Overall it was an amazing day for everyone! On Tuesday 18th October the Chilcote boys' football team played against Hall Green Junior School at Hall Green's pitch. The game started with Chilcote on top, and they got a goal their play deserved through Harry with a strike from the edge of the area. Chilcote continued to dominate and after missing a few opportunities got a second goal through Damian. At half time it was 2v0 to Chilcote. The second half continued in the same fashion with Chilcote making and missing quite a few chances. They did score a third though through Hasanain with a smart left footed finish. Hall Green then had their best spell of the game and managed to get a goal back. Damian then put the game to bed with two finishes from close range. Unfortunately, just before the end of the game Hall Green scored another consolation goal. This meant that the game ended 5v2 to Chilcote. Well done to all of the boys for another great victory!!! On Thursday 13th October the Chilcote boys' football team played against Severne Road school in their second match of the season. The game started well for Chilcote and they took an early lead. They went on to score a few more excellent team goals in the first half. This meant that they went into half time with a 4v0 lead courtesy of goals from Hasanain, and a hat-trick from Damian. In the second half Chilcote continued to play really well and got some more goals, which their play deserved. There were lots of the boys setting up team mates for a goal when they were in a better position. The game ended 9v0 to Chilcote. In the second half Damian scored another goal, Harry score one and Abdur-Rahman scored a hat-trick. Well done to all of the boys for a fantastic performance!!! In Year 2, we have been learning all about Florence Nightingale as part of our topic People of the Past. We have enjoyed finding out about what hospitals were like then and how they have changed. 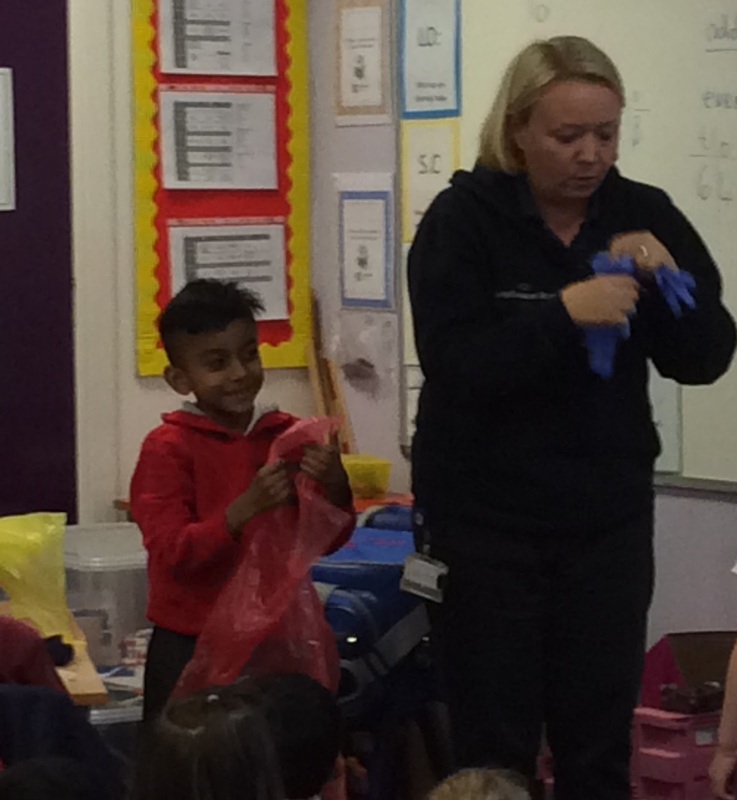 This afternoon, we were very lucky because Nurse Sarah from Birmingham Children's Hospital can to answer all our questions about what it is like to be a nurse now. 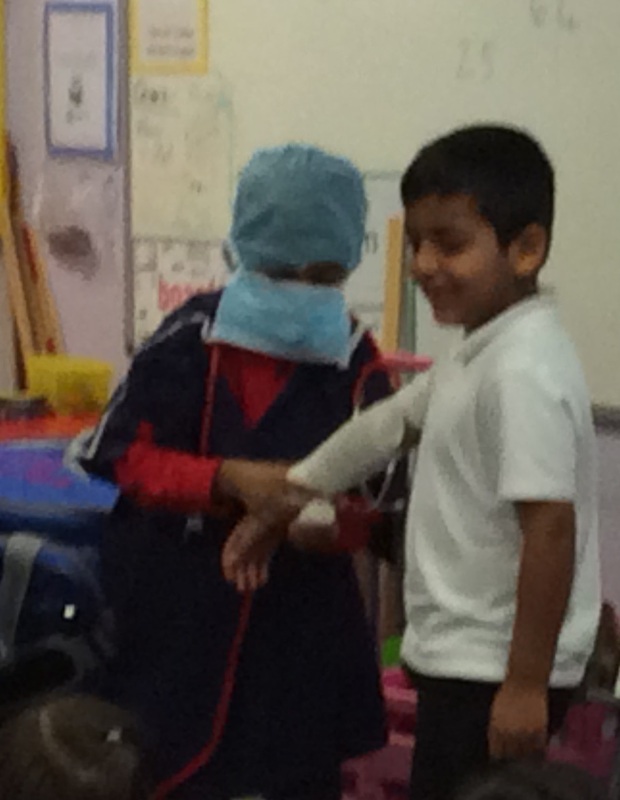 We found out about what she does and how Florence Nightingale's work has affected her job as a nurse. 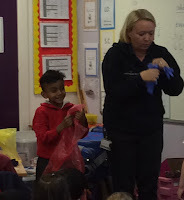 Mrs Walker dressed up in the type of uniform Florence would have worn and then a few children from Year 2 were able to have a go at bandaging someone's arm. We all had part of a nurse's uniform as a souvenir to take away with us. Everyone had a fantastic time. We are very proud of the projects Year 1 have worked on as a homework task. They were asked to find out about a tree in their local area and present it in any way they would like. We are amazed at the creativity and thought put into the work. We have had photos, written work, poems, models, paintings, collages and even a “YouTube”! Well done to everyone and a big “Thank you” for all the support parents and families have given the children. In Year 1 we have been learning through our IPC topic Our World. The topic is all about exploring and learning about the local environment from the pupil’s gardens to their local park. The children thoroughly enjoyed a fun trip to Trittiford Park for their entry point morning to our topic the pupils then explored the local wildlife, allotment gardens and rivers. The children learnt the names of the local trees and their seeds and enjoyed a leaf identification hunt in the park. The children asked insightful questions and were very observant about their local area, all morning the pupils represented the school well showing lots of good behaviour. The pupils collected different materials including leaves, twigs and seeds. In Year 1 we are looking at artwork created by Andy Goldsworthy, in the afternoon the children used their different materials to create a collage. The Year 1 team would like to say a big thank you to parent helpers who joined us for the morning. The pupils had a wonderful time and thoroughly enjoyed their outdoor learning in the park. On Friday 30th September the year 6 boys' football team played in a football tournament against fifteen other schools. The tournament took place at Yardley Wood playing fields. The teams were split into four groups with the top team going through to the semi-finals. Chilcote started against Acocks Green school and despite dominating for the entire game couldn't score so the game ended 0v0. Next, they played against Hollywood and again it was a similar story they just could not get the goal their play deserved and the game ended 0v0. This meant that they had to beat Yarnfield 2v0 in their final game to qualify. The game started in the same vain as they couldn't find a goal, but then it clicked and Chilcote scored two goals in quick succession. They got the result they needed and won 2v0 to qualify for the semi-finals. In the semi-finals Chilcote played against Moseley. The game was very even and both teams had chances but neither side took theirs until a couple of minutes from the end and Chilcote headed in a winner from a cross. They held on and won the game 1v0. In the final Chilcote played against Holy Souls. It was an even game with Holy Souls creating more chances. Just before the break they broke the deadlock and were 1v0 up at half time. Chilcote could not find a goal in the second half and the game ended 1v0 to Holy Souls. All the boys played really well and should be proud to finish as runners up! Well done to all involved!!! On Thursday 29th September twelve children represented Chilcote at a year 3 and 4 mixed football tournament. The children were split into two teams. The tournament took place at the Baverstock Academy. The teams were split into two groups with the top two teams from each group going into the semi-finals and then the final. Chilcote A played in group 1 and had three matches. In the first they beat Bells Farm 4v0. In the second game they had a really close 2v2 draw with Hollywood. Finally they won a thrilling encounter with Yardley Wood 3v2. This meant that they qualified for the semi-finals. Chilcote B played in group 2 and had three matches. In their first game they lost 3v0 to the Oaks. In the second game they lost 5v0 to Cotteridge. Finally, they drew 1v1 with Allens Croft. Unfortunately they didn't qualify for the semi-finals. In the semi-finals Chilcote A played against the Oaks. They played really well and won 4v0. In the final they played against Cotteridge. Unfortunately they lost the game 3v0 but put in a great performance! Well done to both teams as they represented the school brilliantly!! !